Our customer is one of the world’s leading heavy building materials companies, producing aggregates, including stone, gravel and sand, to premixed concrete for use on residential, commercial, civil or industrial projects. Our customer uses an aggregate weigh hopper constructed out of sheet steel. Vibrators are used as a mechanism to transit the flow of aggregate and sand through the hopper. Steel was typically used in hopper construction due to its robust properties, and for this application it needed to withstand the high volumes of highly abrasive materials being handled. 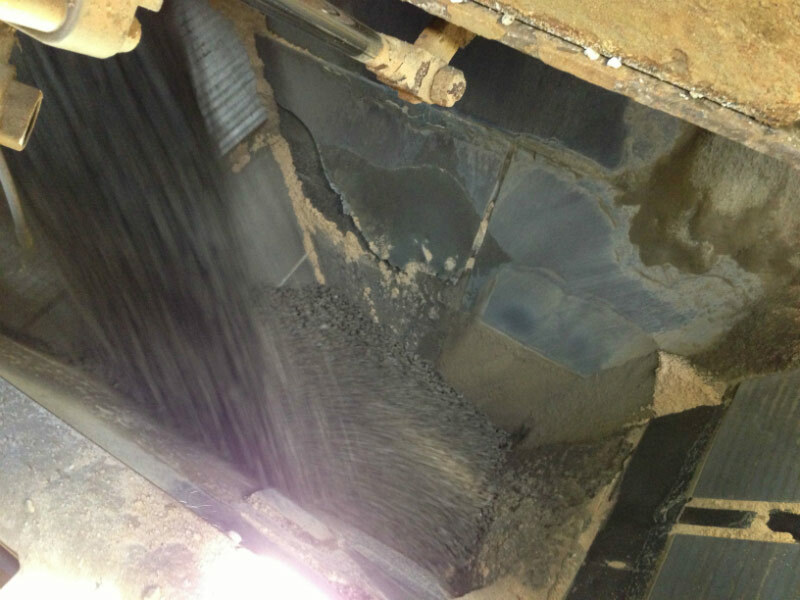 However, because the appearance of the abrasion damage was becoming more frequent, it was resulting in more frequent plant shutdowns. With the accumulation of labour costs due to the need for maintenance in an area that has poor accessibility and confined space requirements, our customer decided to search for a better wear resistance solution. Our customer already had a general awareness of K- Superline®, having worked with it on a different site with a different application. Our customer was keen to use it for this aggregate and sand application. The installation process was very simple and didn’t need much manpower to fit and cut the sheets to size because the polyurethane is significantly lighter than steel. The K- Superline® incorporates a unique bolt-in system to fix the polyurethane sheets so it was a very safe procedure that didn’t require any welding – a key benefit when installing lining in a confined space. After some minor grinding and cleaning of the interior surface, the sheets of K-Superline® attached without complication. K- Superline® has now been installed at the Brooklyn site now for over 18 months and our customer is delighted to report that no signs of wear or tears from the aggregate have been observed. Even with the weigh hopper positioned below a system of 8-10 gates that contain different product before it drops into the hopper from a height of 2 – 3 metres, the overall abrasion of the polyurethane lining sheets has been kept to a minimum. K- Superline® was easy to install and has exceeded our customer’s expectations of its durability potential.